More than 200 drivers a day were caught using a mobile at the wheel immediately after tougher penalties for the offence came into effect, figures show. UK police caught almost 6,000 drivers using their devices while driving in the four weeks after 1 March. The numbers were obtained by the Press Association under the Freedom of Information (FOI) Act. The high number of people breaking the law means the “key message still isn’t sinking in”, said Steve Gooding, director of motoring research charity The RAC Foundation. “Driving is a safety-critical activity that requires our full attention. 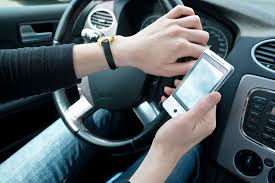 Hands need to be on the wheel and eyes looking out of the windscreen, not down at the phone screen,” he added. Road safety charity Brake called for the £200 fine to be “significantly increased” to deter offenders. “Driver distraction is a growing menace and it’s worrying that drivers don’t seem to be getting the message,” said Brake spokesman Jack Kushner.